This week, two people pleaded guilty to accepting bribes and helping rig bids for Detroit demolition contracts. Both men worked for the Adamo Group, one of the city’s major demolition contractors. One also worked briefly as a city employee involved in soliciting bids for demolition contracts. Detroit Mayor Mike Duggan says this lifts a cloud that’s been hanging over city government and the demolition program. “98% of what occurred in this case had nothing to do with the city,” said Duggan, adding he feels Adamo was also a “victim” of this scheme. As for how the demolition program is running now, “I feel extremely good about the job that the building authority and the [Detroit] land bank and the city procurement folks are doing today,” he said. Duggan said other problems with the demolition program, such as contractors improperly handling asbestos materials and using potentially contaminated dirt as infill, have been addressed. He doesn’t see a need for increased oversight or quality controls. 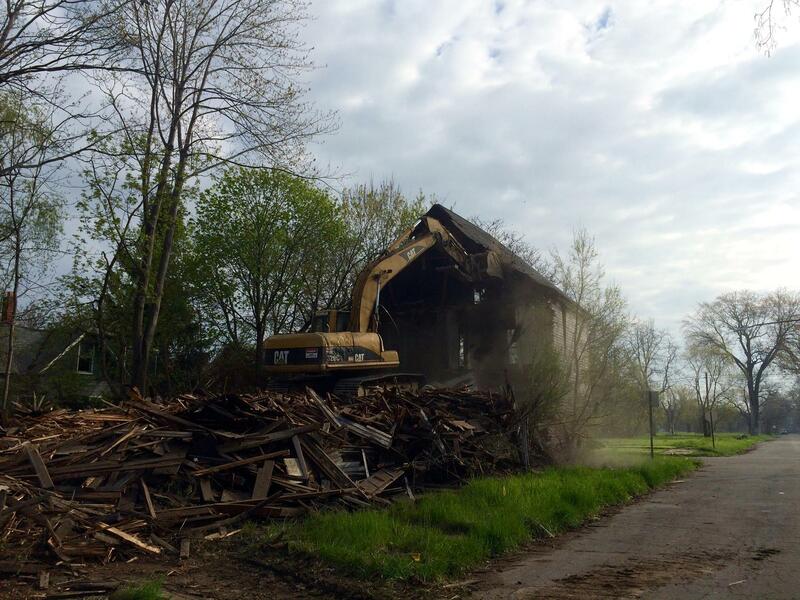 Duggan has admitted to “mistakes,” but otherwise staunchly defends his demolition program, which has brought down more than 17,000 vacant structures as part of an ambitious blight elimination effort. The program has been funded primarily by more than $250 million from the federal Hardest Hit Fund. It’s not yet clear if more charges are coming for demolition contractors or contractor employees implicated in the corruption. During his plea hearing Aradondo Haskins, the ex-Adamo and city employee who part in the bid-rigging scheme, identified his bribe-payer as the firm Environmental Specialty Services. Detroit’s two representatives in Congress are worried that state regulators may be letting hazards slip through the cracks of federally-funded demolition programs. Reps. Rashida Tlaib and Brenda Lawrence, both Democrats, outline those worries in letters sent to the Michigan Department of Environmental Quality and Michigan State Housing Development Authority Friday. They urge the agencies to investigate possible public health concerns from potentially contaminated demolition sites in Detroit. But they also express concerns about federally-funded blight elimination programs statewide, and urge the state agencies to fully implement recommendations from a 2017 federal report on Flint’s demolition program. Detroit has by far the biggest demolition program in the state. It’s demolished more than 11,000 blighted homes during Mayor Mike Duggan’s tenure, mostly by using about $250 million from the federal Hardest Hit Fund. A federal investigation into Detroit’s demolition program under Mayor Mike Duggan seems to be picking up speed, and possibly widening in scope. Federal agents visited the Detroit land bank Wednesday. The land bank has used almost $130 million in federal money, originally allocated for foreclosure prevention, on demolitions as part of Duggan’s aggressive blight elimination campaign. Detroit’s rapid-fire demolition campaign under Mayor Mike Duggan was rife with questionable bidding practices and lacked major internal controls, according to state and federal reviews of that program. That revelation emerged Monday, as the city announced the U.S. Treasury had released another $42 million in federal funds for the program. But that funding had been suspended for two months, as the treasury department reviewed a Michigan State Housing Development Authority investigation.